April 8, 2016 - Updated: 6:15 p.m.
QUEENS, NY - Jerad Eickhoff allowed three runs (two earned) on five hits, walking two and striking out three over five innings of a 7-2 loss to the Mets on Friday afternoon. He threw just 48 of his 87 pitches for strikes, and with just 14 first pitch strikes he was battling from behind most of the day. 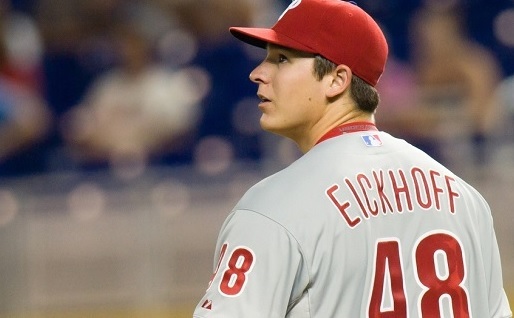 "I felt frustrated because I wasn't executing my fastball," Eickhoff said. "Most of the day, really, when I had to make a pitch I made a pitch, fortunately." The Mets scored twice in the sixth inning and four times in the seventh. Neil Walker had an RBI single in each inning, and Michael Conforto delivered an RBI double in the sixth and a two-run single in the seventh. Odubel Herrera and Cesar Hernandez had RBI singles for the Phillies, who have been outscored 26-12 in losing their first four games. "We're not the best-hitting team in the league, but we're certainly better than we're showing," Phillies manager Pete Mackanin said. "We've got to get everybody going. It seems like they're trying too hard." Trailing 1-0, Herrera lined a single to left to score Eickhoff and tie the contest (+.163 WPA). Eickhoff originally reached with an inning-opening double and advanced to third on a Freddy Galvis groundout to short. Conforto's double in the home portion of the sixth was the biggest play for the Mets, pushing their lead to 3-1 (+.131 WPA). James Russell faced six batters and recorded just one out. He surrendered three hits, four earned runs, and two walks. In a bullpen that has been disastrous to open the season, he's looked the worst. The two clubs resume their three-game series on Saturday night with Vinny Velasquez set to oppose Bartolo Colon. Unfortunately, rain is in the forecast.